The IST Gravity Rack is a freestanding system for processing work-up tools that require gravity flow. The system is ideal for processing ISOLUTE HM-N Supported Liquid Extraction Columns and ISOLUTE Phase Separators. The system is constructed from polyethylene and is compatible with all ISOLUTE column configurations, 3 to 70 mL. 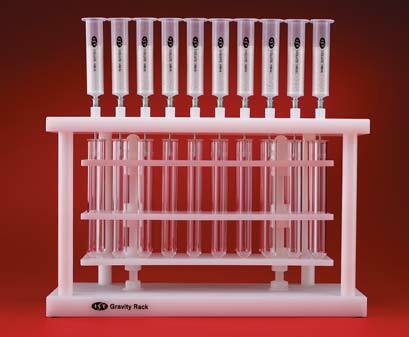 The Gravity Rack can process 20 columns up to and including the 25 mL format simultaneously; the system can process ten 70 mL columns at any one time. The unique two-part design ensures no cross contamination issues and easy access to collected fractions. The Gravity Rack will accommodate 16 and 19 mm collection tubes and is compatible with the range of PTFE stopcock and stopcock needle options, see below. The system is supplied with stainless steel needles as standard.